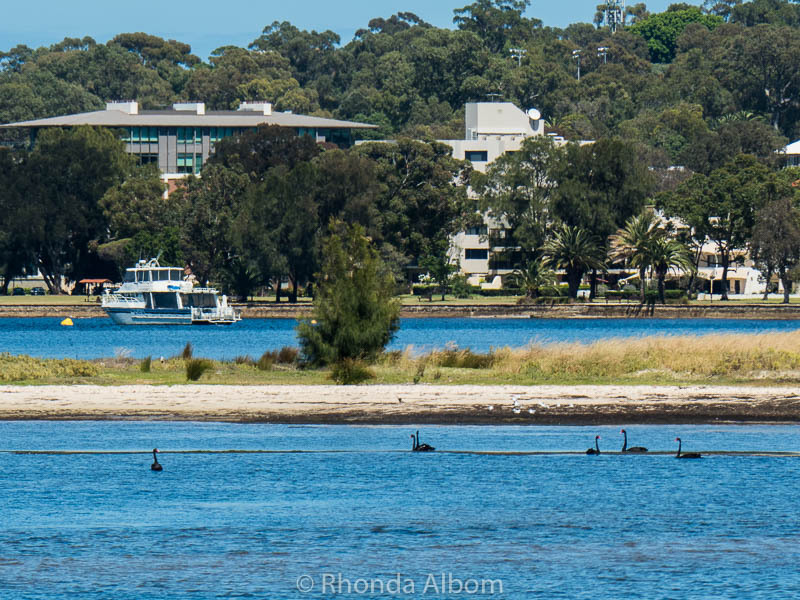 Black swans dot the banks and give the Swan River her name according to the commentary on board the hour-long Captain Cook cruise from Perth to Fremantle in Western Australia (WA). 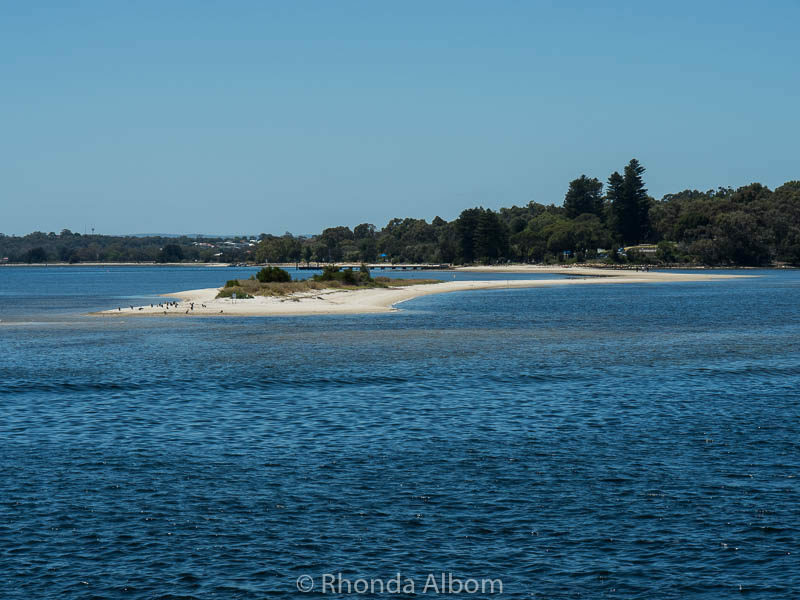 It’s easy to see why it is named Swan River. 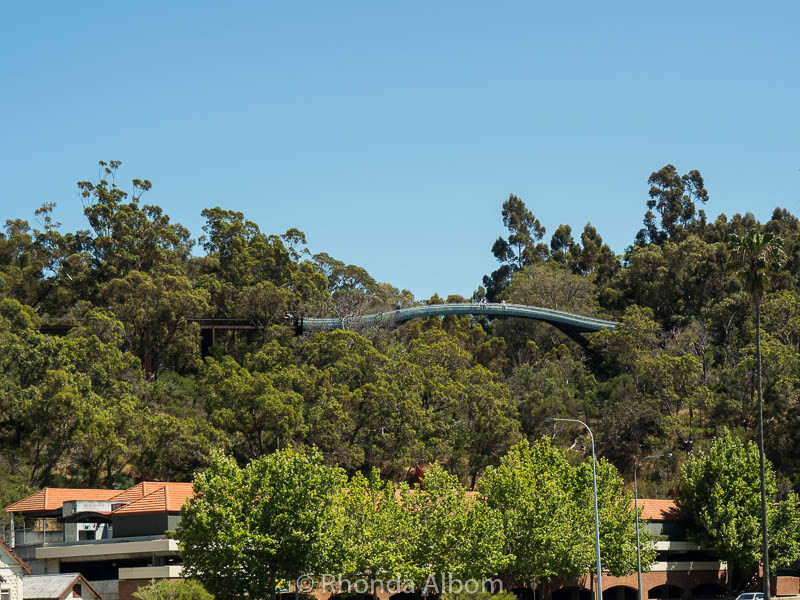 Viewing the glass bridge as we cruised past WA’s Botanic Garden in Kings Park. Point Walter Sandbar jutting out into the river. 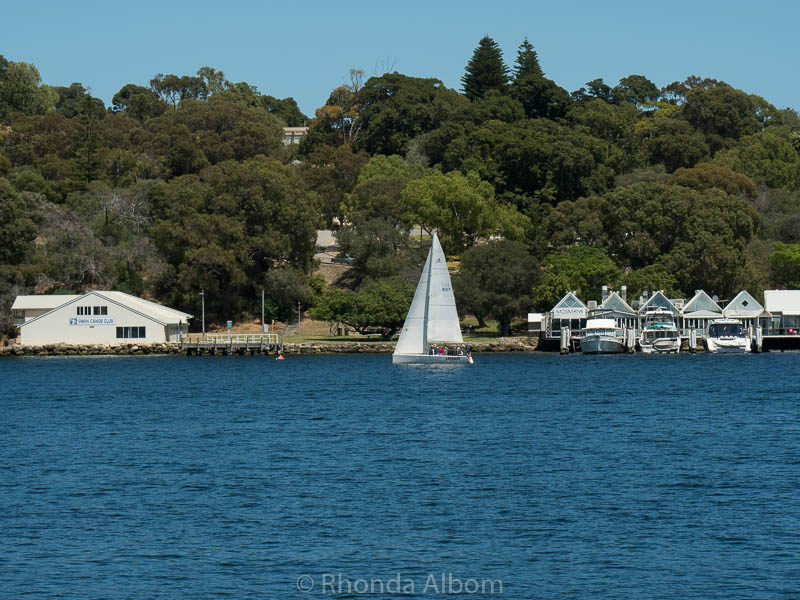 As we cruised past the Swan Canoe Club, it was this contrast of the white sail that caught my eye. 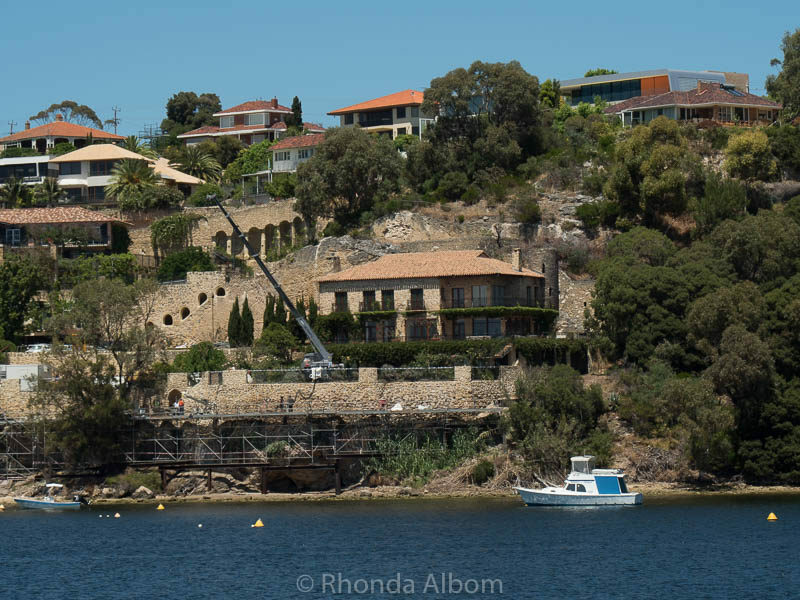 These huge homes are a portion of “millionaire’s row”. Any town with an official “Cappuccino Strip” is one that I like. This is both sides of the street. Of course, we stopped in one of the cafes for a coffee and a visit with Steve, a local travel blogger. 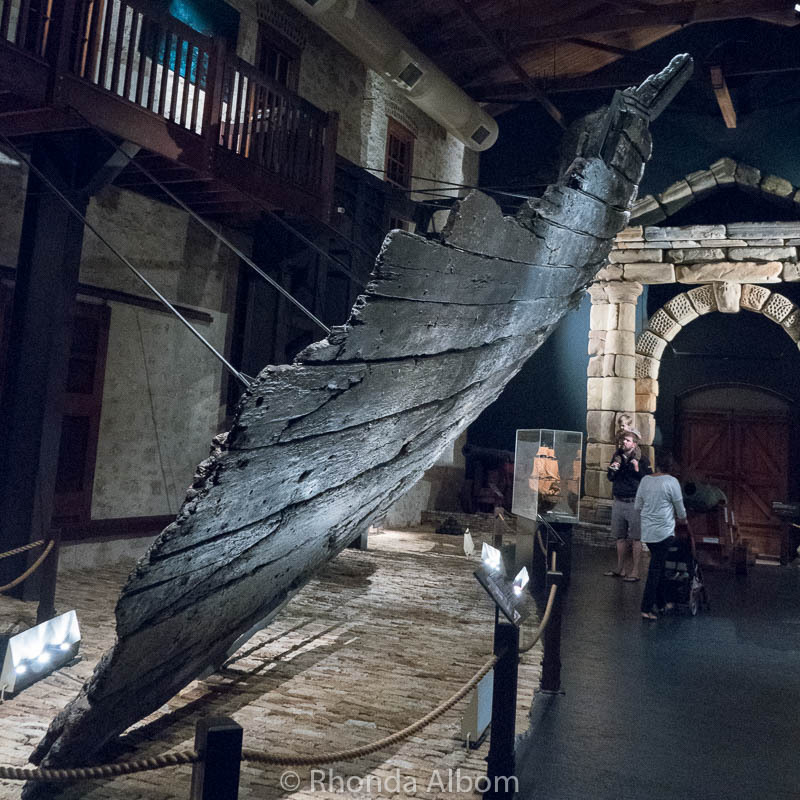 This is the remains of the Batavia at the WA Shipwrecks Museum, a must-see museum along the coastal walk. The Round House was purpose built as a gaol (jail). It is the oldest public building in the Western Australia. It is situated on the hill above the beach. The tunnel below the round house was built back in the whaling days to make it easier to drag whales from the beach to the town. 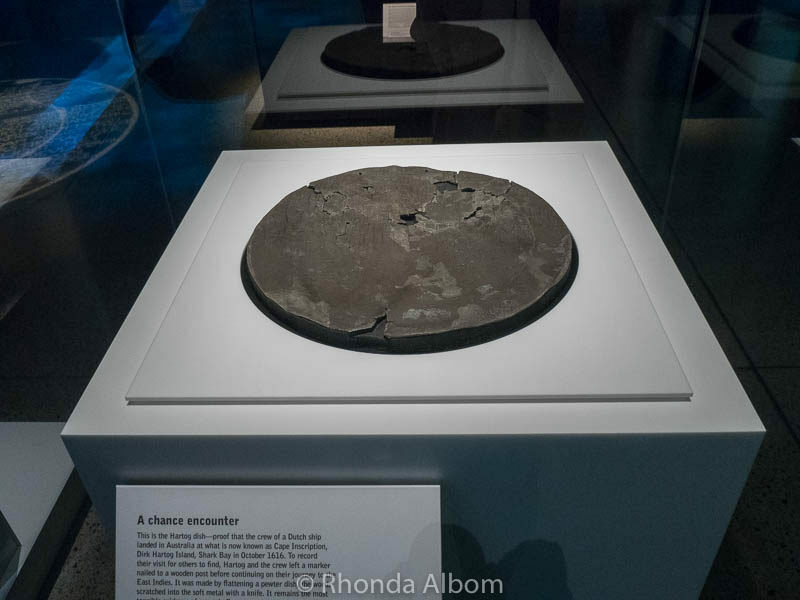 This plate was nailed to a tree in 1616 by Hartog when he discovered Australia. Thinking there was nothing interesting here, he nailed the disc and left. Now it is so fragile it must lay flat. It’s on exhibit at the WA Maritime Museum. This is two sections of a giant mural still in the works. We were lucky enough to meet artist Graeme Miles Richards who has been working on this building for 2.5 years. One side is very nautical, the other is worldly. They are 50m and 86m respectively. 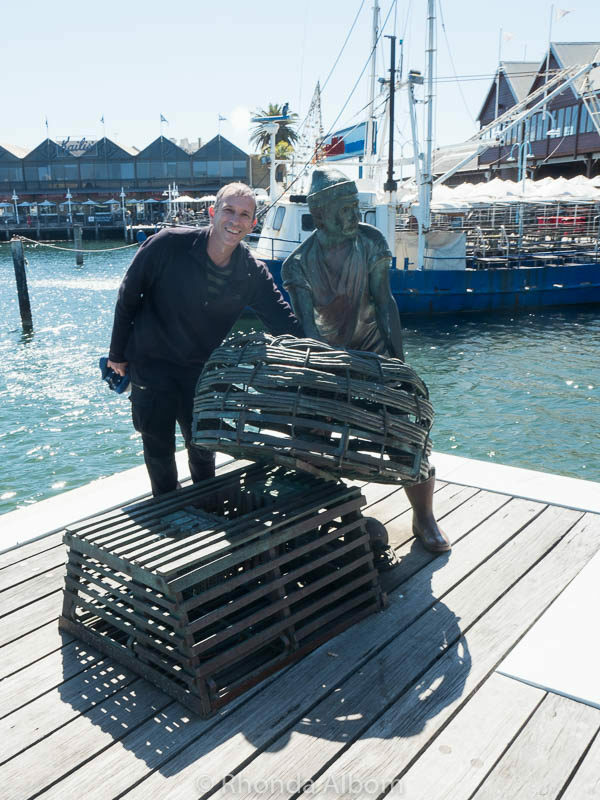 Hubby stands with one of many sculptures in town, this one with Cicerello’s in the background – boasting the best fish and chips in Western Australia. Ask for the award winners, which cost a few dollars more than the traditional/cheapest fish and chips on the menu (these are made from New Zealand hoki). If you’re a surfer or a yachtie, Fremantle should be on your bucket list. Fremantle was host to the America’s Cup yachting race in 1987. 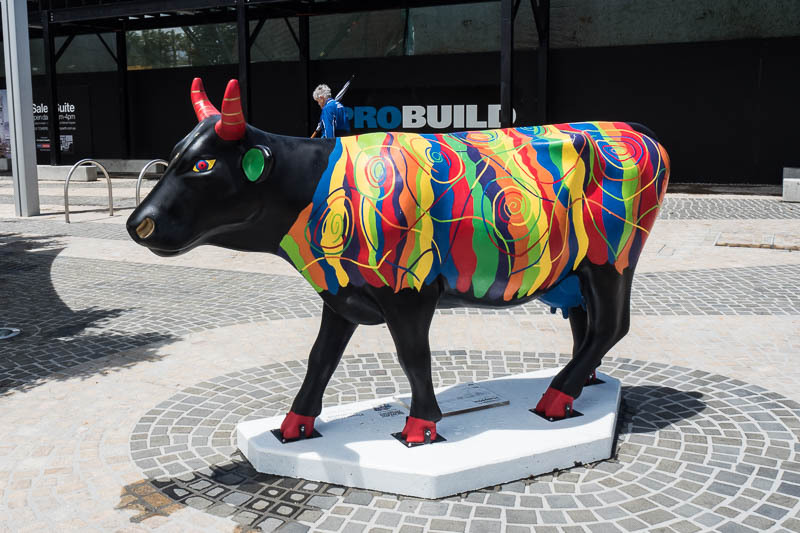 The Fremantle Doctor is what locals call the consistent breeze that blows to the shores of Fremantle Harbour. Like in Perth, the local buses are free to ride. 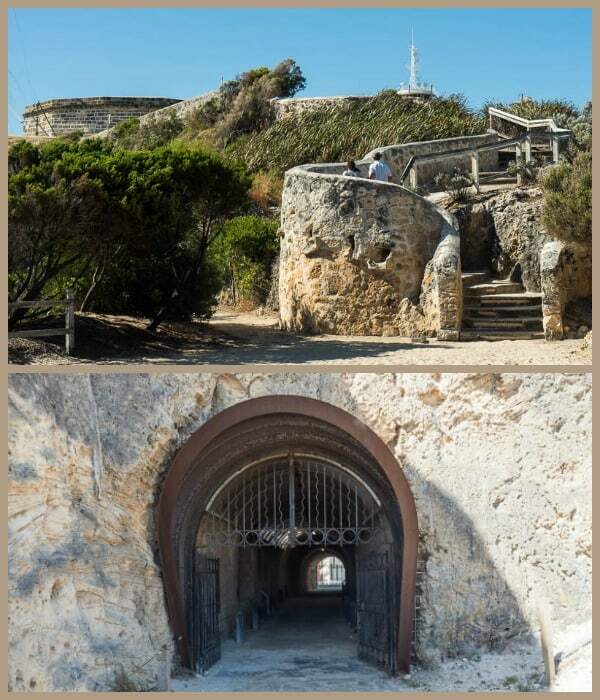 If you are staying in Perth, do what we did and take a sightseeing river cruise to Fremantle and take the train back. The Round House closes at 3.30 so be sure to time your day better than we did if you want to get inside. We have heard the Fremantle Prison is fascinating, however, the only way to visit is with a 90-minute tour (and we were too tired). Check the Art Centre website before heading there to be sure there is an exhibit. When we arrived, there was nothing to see other than the gift shop. Next time we head to Perth we will be sure to have time to explore the region, starting with Lonely Planet West Coast Australia. While Perth was labelled as the last city after 16 days onboard the Radiance of the Seas, in reality, we disembarked in Fremantle. Once on land, we headed straight to our hotel in Perth as even packing super light, we don’t want to carry our stuff around when we are exploring a new region. 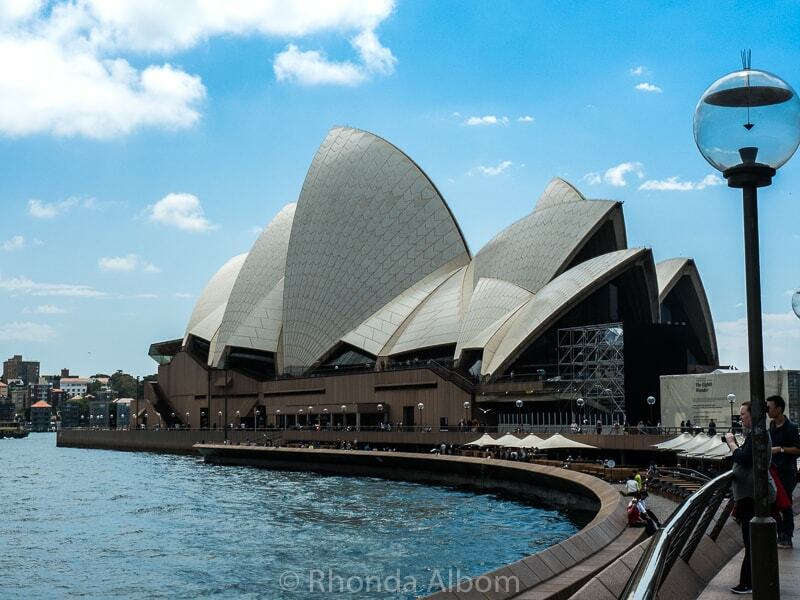 Our Royal Caribbean cruise started in Sydney and sailed over the top of Australia with port stops in Brisbane, Caines, Darwin, Bali Indonesia, Port Hedlands, and Geraldton. 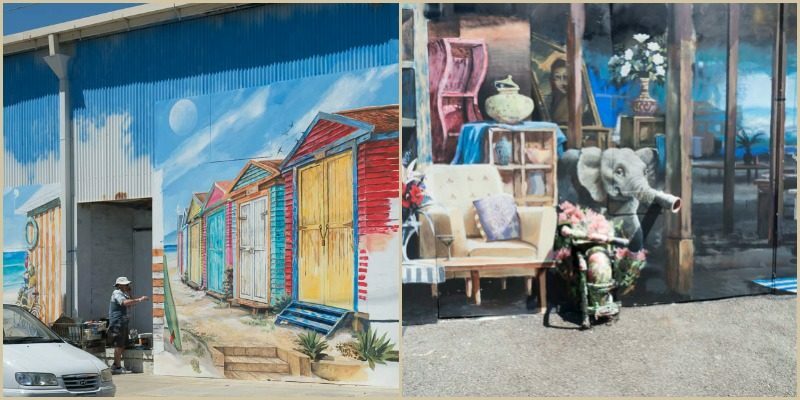 Have you heard of or visited Fremantle? i have not heard of Fremantle but seems a fab place to visit. For the black swans alone. Toss in great eats and sweet street art and I am sold. Beautiful pictures Rhonda! 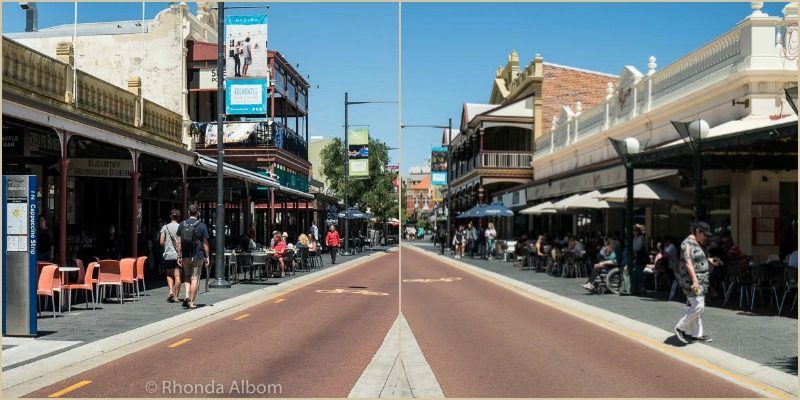 I spent some time in Fremantle. It’s such a cool place. The cruise looks like it was lovely. Fremantle took me by surprise as it was the port city, but it was Perth that was talked about as the destination. such joy to see all those beautiful clear sky and the river. So soothing..
We were lucky to have such a fine day. You always take such beautiful photographs! That’s so interesting that the Round House was a jail. Such an interesting place! Well, Australia was a settled in part as a penal colony. Love the Sandbank. Nice town! I loved that sandbank too. It just floats out into the water so gracefully. LOL – yes it is summer down under. Wow, so beautiful. The sea is so crystal clear. Thank you for sharing. It was really beautiful there. I’ve never seen so many black swans all in one place, they’re stunning! Do you see white swans on the river too? Now that you mention it, no I didn’t see any white swans. We have black swans living on the by by my house in NZ and there are no white swans here either so it seemed really normal. Enjoyed this armchair travel this morning. Thanks for sharing this! Happy to bring a smile your way. The sea is blindingly, beautifully blue! Great shots. I am a huge fan of the water as well. I love being on any type of boats. The city looks lovely and you got really nice weather, Pretty trip! We had only one sunny day of three in Perth. Unusual, as my understanding is that it has generally great weather. I won’t be living on millionaire’s row either, but is sure is fun to cruise by and have a look. This looks like such an interesting place to visit. And great photos, too. Thanks Ruth, and I could have used at least one more day there to better explore the city. What a way to end your cruise. I would have dumped the luggage right away too and then off for some great coffee and a bit of something. You both had an amazing cruise. I would love to be on the water here in our own boat. I like that kind of cruising the very best. 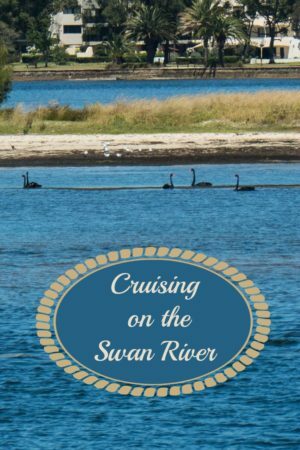 Agreed, the swan river would be a great place to spend some time in a private boat. Ironic a jail would be the first building. Cool you got to see the glass bridge from the water. Australia was started as a penal colony. Rhonda, it looks like you had a great cruise down to Fremantle and it was a pleasure to meet with you Jeff for a coffee. It was fun meeting you too. Maybe next time we will have a longer visit. Actually, it was two museums, the Shipwreck Museum and the Maritime Museum are different locations.